Smartwatches haven't exactly taken off. In fact, a number of electronics companies have pulled back on plans for Android Wear including Motorola, Sony, and Asus. That's left fewer smartphone makers in the fray, but there are also fashion designers and traditional watch designers dabbling in Wear. We will see a lot more of these smartwatches in 2017, and one of them is the extremely spendy Tag Heuer Connected Modular 45. This is the second Android Wear device from Tag Heuer, and like the first one, it's being produced in partnership with Intel. It has a lot in common with the company's other watches, for example the high price tag. The Connected Modular 45 starts at $1,500 and can reach around $5,000 if you really go all out. However, it's not better at any of the typical smartwatch things than other devices—actually, it's worse at some of them. It's a real head-scratcher. Design The titanium case and sapphire screen are durable materials. Customization There are tons of combinations with different cases, lugs, and straps. NFC Supports Android Pay, which is very much appreciated when some other watches have omitted it. Strap The deployant clasp is sturdy and very convenient. Software Comes with the latest version of Android Wear. My brand It's got the Tag Heuer brand stamped on it, if you care about such things. Design again It's a very blocky watch, which a lot of people won't like. Price The $1,500 starting price is a bit crazy considering the features. Performance Despite having an SoC that should be snappy, the watch is sluggish. Watches that cost a fraction as much are noticeably faster. Missing hardware No heart rate sensor or speaker? Not what I'd expect for a $1,500 watch. Display It's mediocre with middling brightness and a dingy image quality. Size This watch is huge. It's too large for someone with small wrists to wear—the band doesn't even get small enough me. Strap again All the lugs and straps are proprietary, so you have to buy them from Tag Heuer. They too are very expensive. The Tag Heuer Connected Modular 45 is a colossal watch. The "45" indicates the 45mm width of the body, but that doesn't tell the whole story. The lugs and the frame of the watch extend far away from the face—those black trapezoid shapes (Tag calls this a "wing") at the top and bottom of the face better illustrate how large the watch is. If you have small wrists like me, this watch looks unnaturally big. Most watches are made of plastic and (if you're lucky) aluminum. 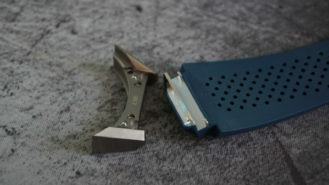 The case of the Tag Heuer Connected Modular 45 is milled from a solid block of titanium. 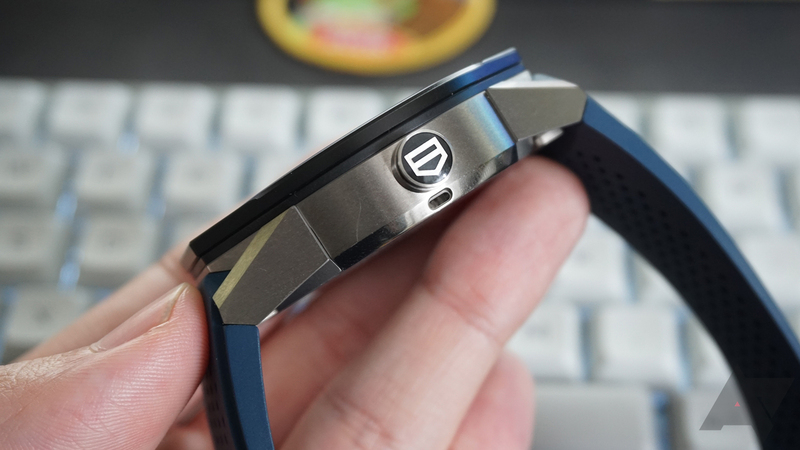 The lugs and the clasp are also titanium, but the anodized bezel is aluminum. The watch is nearly indestructible, but it's heavy because of the titanium chassis. It's 116g with the strap, but a Zenwatch 3 is only 60g. Looking at it another way, the watch is only slightly lighter than the LG X Style, a 5-inch smartphone that came out last year (121g). The crown button is dead center on the right edge. It has just the right firmness with a tactile click when pressed. However, this is only a button. There's no rotating action to scroll through items in Wear 2.0. The base model watch comes with a thick rubber strap, which is fine. I wouldn't call it visually impressive, though. For $1,500 I would expect a nice leather or metal band of some sort. The band and lugs disconnect with a button on the underside, which is the "modular" part of the Connected Modular 45. You can swap lugs and bands, but this is a completely custom design. You have to buy all these accessories from Tag Heuer, and they too are extremely expensive. 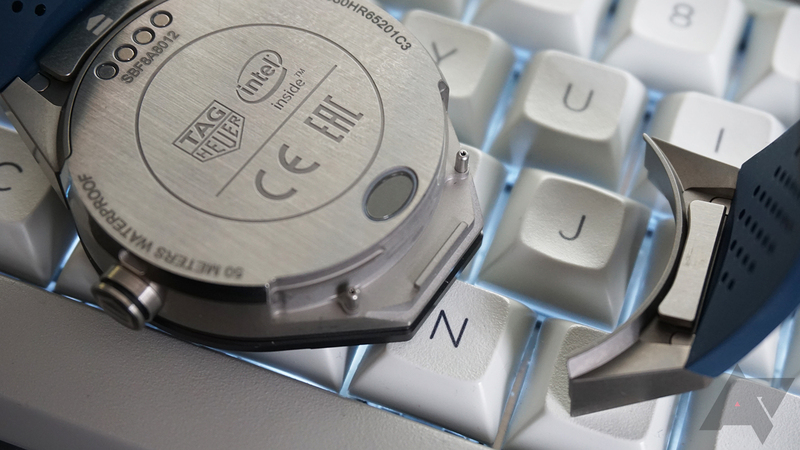 I'm a big fan of Tag Heuer's latch mechanism, which Asus copied on the original Zenwatch. It's a deployant clasp that's super-easy to put on and take off. After you size it, simply fold the mechanism closed and it latches. Then, press the buttons on either side to release the latch. 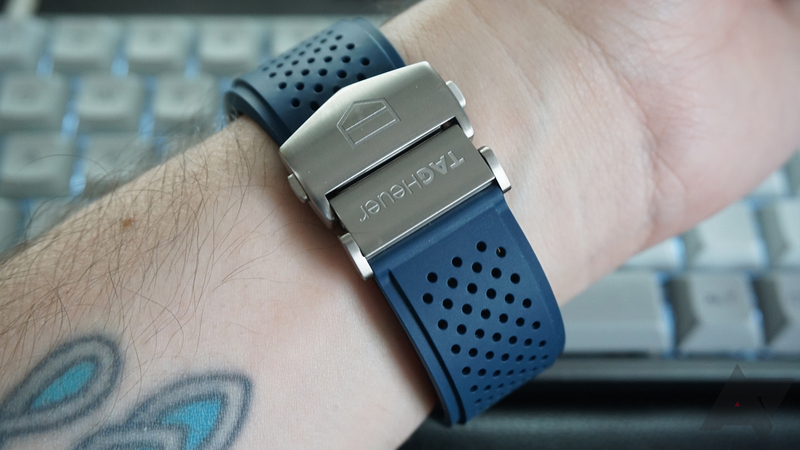 It allows for a very clean look as the excess band is tucked inside against your wrist. In the case of the stock rubber band, the latch is a bit annoying for me. The band tapers, which limits how much you can adjust the size. Even when it's as small as I can make it, the Connected Modular 45 is slightly too loose. The aesthetics are, of course, highly subjective. That said, my opinion of the Connected Modular 45's design is not positive. I don't think I'd call it an ugly watch, but it's aggressively masculine with all the sharp angles and blocky frame. It just looks overwrought to me. I showed the watch to a number of people, most of whom were unimpressed by the design; a few said it was downright ugly, too. I did hear one thing a lot, though. No one could believe this watch costs $1,500. 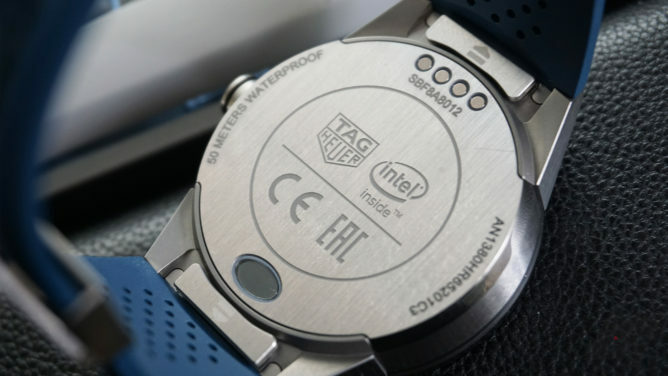 Inside, the Tag Heuer Connected Modular 45 has an Intel Atom Z34XX SoC, GPS, NFC, and the usual raft of orientation sensors. Having NFC for Android Pay is cool, but you have to do some wrist contortions to place the face of the watch on the payment terminal. The setup process is a bit of a pain, too. You need to authorize your card all over again like you were using a new phone. It is frankly baffling to me that this $1,500 smartwatch doesn't have a heart rate sensor. I mean, surely such a high price tag should get you a sensor that's found in cheap fitness bands, right? Apparently not. There is a microphone cutout on the side of the watch, but there's also no speaker. Again, this is a really expensive smartwatch, and it lacks features that you get in watches that cost a fraction as much. This is a 1.39-inch AMOLED panel with a resolution of 400x400. It's completely round, which is thankfully more common these days. There is an ambient light sensor under the screen, so you don't have to set the brightness manually. It doesn't get particularly bright, though. Using the Tag Heuer Connected Modular 45 outside is a bit of a chore, which isn't helped by the fact that the display is weirdly "deep" under the glass. 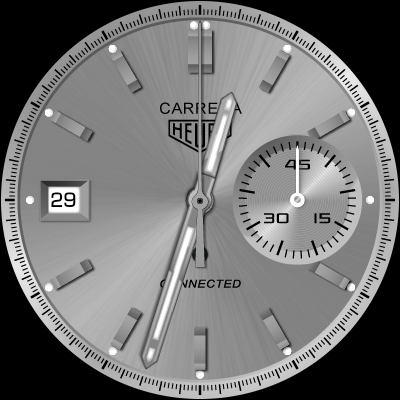 Most devices go for the gapless look, but Tag Heuer wanted the screen to be at the same depth as the face on its mechanical watches. I don't think it worked very well in practice. Since this is an AMOLED, the blacks are truly black. The colors seem weirdly muted for an AMOLED, and the white balance is way too warm. The panel also has a fuzzy quality that's especially visible on gray background. That's something Wear 2.0 has in spades. I don't know the providence of this screen, but it looks a lot like LG's P-OLED technology from several years ago—it's dingy and I don't like it. There's also noticeable ghosting on the Modular 45's screen compared to any other modern watch. Perhaps one upshot here is that you probably won't scratch the display. It's covered with a sheet of sapphire glass, which is much harder than the Gorilla Glass used on other devices. 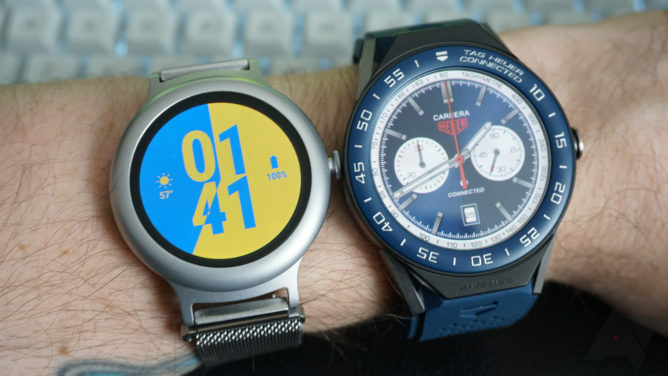 The dual-core Intel Atom chip in this watch should be more than fast enough to power Android Wear, at least on paper. In practice, this watch is insultingly slow. It doesn't outright lag most of the time, but it's not responsive. The watch is always rushing to catch up with my finger as I scroll and swipe. Again, I feel it necessary to bring up the price. 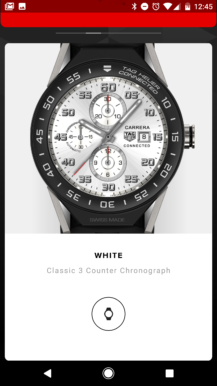 If I spend $1,500 on a smartwatch, it had better be blazing fast, and the Tag Heuer Connected Modular 45 is not. I suspect the SoC is tuned very conservatively. After all, this chip came out several years ago and is based on an inefficient 22nm process. Launching apps—which is a thing we have to do on smartwatches now, like it or not—is also quite sluggish on the Tag Heuer watch. This is never particularly fast on watches, but the Connected Modular 45 is at least a second or two slower compared to the Watch Style. And by the way, you could buy six Watch Styles for the price of one Tag Heuer Connected Modular 45. This watch has a respectable 410mAh battery inside. It gets pretty standard battery life for a Wear device: around 18-20 hours. I have not had to worry about charging the Connected Modular 45 while I'm still out and about, except for the first day when it drained oddly fast in just a few hours. That seems to have been an outlier, though. You'll still be charging this watch every night, but it'll make it through one day comfortably. When you do have to plug the watch in, the charger is actually quite good. It's a pogo pin situation, as are many smartwatches. However, the charging puck attaches with strong magnets that ensure it's aligned the right way. The Connected Modular 45 ships with Android Wear 2.0, and I suppose that's a good thing. Devices shipping with current software is nice in theory, but I still can't get over some of the decisions Google made in Wear 2.0. To be clear, these are not specific complaints to the Connected Modular 45, but you should know what you're getting into when you pick up this $1,500 watch. The way notifications are handled in Wear 2.0 continues to baffle me. Basically, any app that uses the standard notification bundling API gets its notifications split up on the watch. You see this most often with Gmail, which gives each email its own screen. That means a lot of scrolling to get through everything. This is made more annoying by the lack of a digital crown on the Connected Modular 45. Disconnecting the watch's do not disturb from the phone's is also a negative, in my opinion. 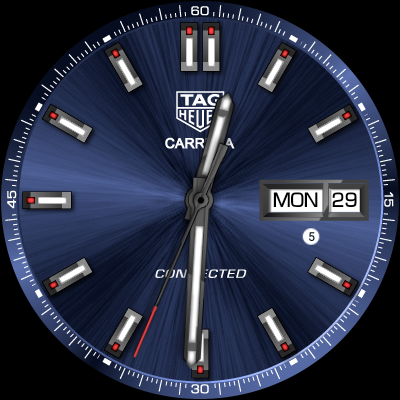 All the watch face improvements in Wear 2.0 are great, but Tag Heuer didn't take advantage of them. 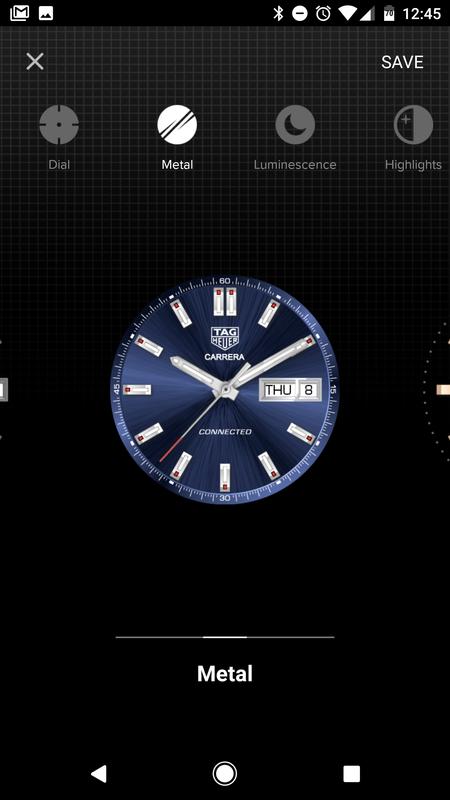 The stock watch faces, which you can see in the gallery above, look nice enough with the standard Tag Heuer aesthetic. There's almost no interactivity, though. Only one of them supports complications, a few others have built-in chronographs, and the others let you choose between several dial colors. 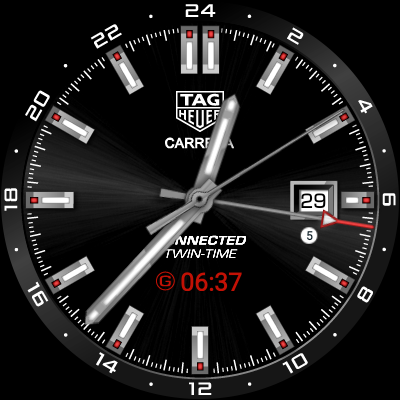 Actually, the fully editable "Tag Heuer Studio" face is done quite well, and the resulting watch faces do look very different. 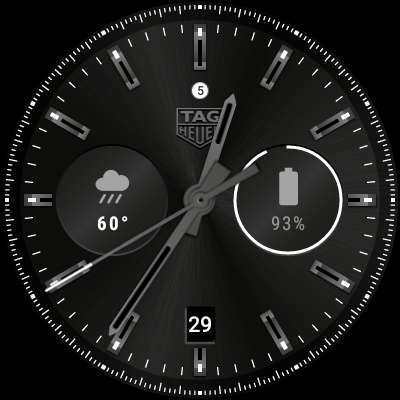 Still, there are plenty of third-party watch faces that are just as pretty and include many more features. 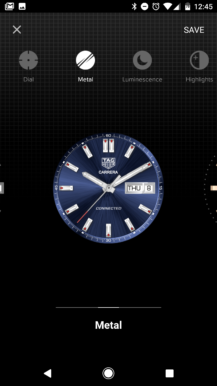 But hey, these are official Tag Heuer TM watch faces. Some people care about that sort of thing. 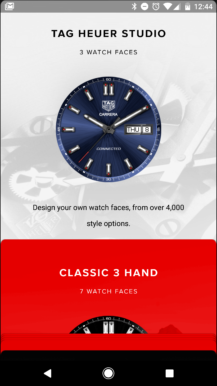 There is a Tag Heuer app for your phone, which I was hoping would offer some unique features to help justify that high price tag. Nope—the Connected app lets you create customized watch faces in the Tag Heuer Studio, but the settings are the same that are available on the watch itself. 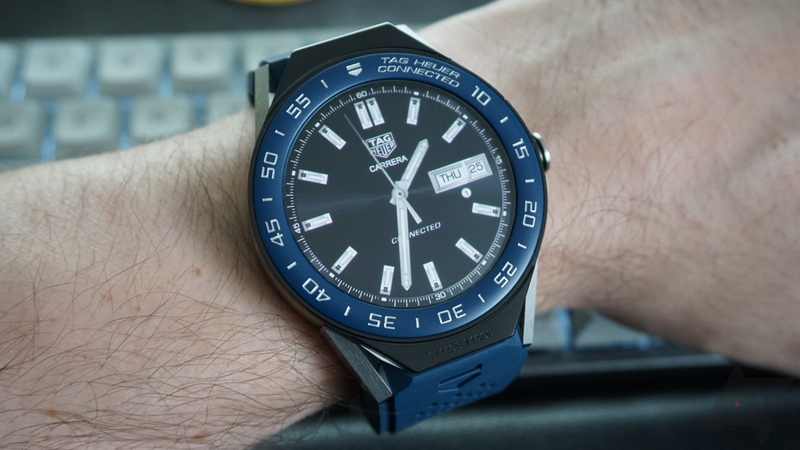 I think the kindest thing I can say about the Tag Heuer Connected Modular 45 is that the build quality is very good. It's a big chunk of titanium, so yes, it's solid. Tag Heuer knows how to make watches, so everything fits together well. Despite the fact that the lugs can be swapped out, the Connected Modular 45 feels like a single unit. I'm not really a fan of the overall design, and it's a very, very large watch. I have small wrists, and it looks comically big on me. The stock rubber strap is very nice as far as such bands go, but this is a $1,500 watch. It seems like a nice leather band should come with it, but you have spend at least a few hundred more for those. Yes, you need to buy bands for this modular watch from Tag Heuer. The connection to the modular lugs is not standard, and additional rubber straps are $115. The leather ones will set you back $275, which is enough to buy a cheaper smartwatch. The metal and ceramic bands are priced between $700 and $1,000. If these prices are at all surprising, let me just remind you this watch only starts at $1,500. 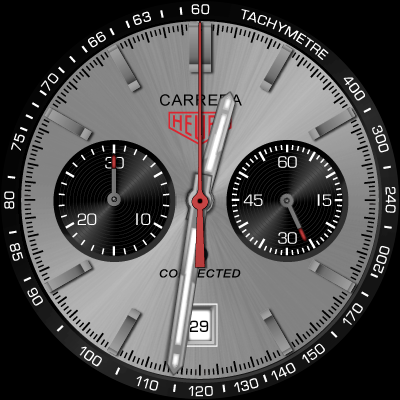 While Tag Heuer clearly paid attention to the watch aspects of the watch, it dropped the ball when it comes to much of the technology. The Connected Modular 45 has NFC, which is nice to see. However, there's no digital crown for scrolling, the screen is mediocre at best, and there's no heart rate sensor or speaker. The biggest issue for me is the sluggish performance, which is omnipresent and hugely annoying. The software simply is not well optimized for the Intel Atom chip in this watch. It definitely needs more work, but I don't know if anyone is going to do it. You can't buy a smartwatch without considering the state of Android Wear. Notifications, do not disturb, and app management are all in need of work. It's hard to justify spending a few hundred on an Android Wear device right now, let alone $1,500. That's what it comes down to: the price. Before you get worked up about all the little issues with this watch, you have to confront the high price tag. 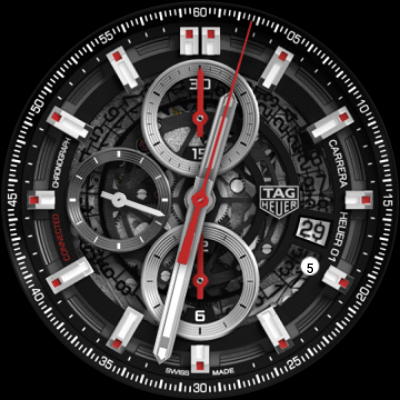 The Tag Heuer Connected Modular 45 does many of the same things as other smartwatches, but it has a titanium case with the Tag Heuer logo. You could make the argument that an expensive mechanical watch at least partially justifies the price because the internal mechanisms are of higher quality. 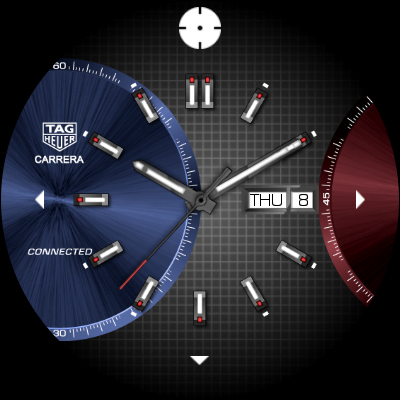 However, the Connected Modular 45 is still just a regular smartwatch inside. It has a supposedly more powerful SoC, but one that isn't doing it any favors. It's unlikely many AP readers were considering purchasing this watch, but this is something to keep in mind as more fashion companies and watch makers get into Android Wear. It's still just a smartwatch—stamping a big name on the outside doesn't mean it'll be better than a $250 smartwatch. In fact, it might be worse.